We’d love your help. Let us know what’s wrong with this preview of Bound by Guilt by C.J. Darlington. Roxi Gold feels like a throwaway. Shuttled from one foster home to another for most of her life, she longs for a real family and a place to call home. She’ll do anything to fit in and please her new guardian—even if it’s against the law. Soon she’s traveling the country in an RV stealing rare books from unsuspecting bookstores even as guilt hounds her. Police officer Abby Roxi Gold feels like a throwaway. Shuttled from one foster home to another for most of her life, she longs for a real family and a place to call home. She’ll do anything to fit in and please her new guardian—even if it’s against the law. Soon she’s traveling the country in an RV stealing rare books from unsuspecting bookstores even as guilt hounds her. Police officer Abby Dawson has witnessed the worst of society, and not just at work. Her high-powered attorney ex-husband has wrested her daughter away from her in a bitter custody battle, and she’s lucky if she sees her daughter at all. The job she once loved has become a chore, the world isn’t any safer, and her life seems to have no purpose. To ask other readers questions about Bound by Guilt, please sign up. Finally, Christian Fiction worth reading--I couldn't actually put this down and ended up staying up late to finish it. I can totally see why this author has won awards for her writing. 1. The Christian worldview wasn't compromised--right and wrong were clearly distinguishable. When characters made mistakes they suffered consequences but there was also grace and forgiveness when they were truly repentant. 2. The storyline was different. The author clearly has a heart fo Finally, Christian Fiction worth reading--I couldn't actually put this down and ended up staying up late to finish it. I can totally see why this author has won awards for her writing. 2. The storyline was different. The author clearly has a heart for teenagers from broken families and abusive backgrounds. The main character is from such a family and struggles with a number of long-term issues as a result. I liked the depth and reality of this character. The message was clearly that God can deal with any issues and that everyone has them! 3. The crime occurred at the beginning of the book and the reader was present throughout. That created dramatic tension as the other characters scrambled to establish what had happened. The suspense aspect was whether or not the authorities would catch up with the suspects. The plot unfolded well and kept me hooked until the end. 4. The main character is helped along the way by various fringe characters--they all mention faith in God but not in a compulsive way, it just forms part of the natural conversation. This is how it should be in reality if Christians are truly focused on God in their everyday lives--how can we meet someone or have a conversation without Him being mentioned if He is present in everything we do. This was a good reminder that we can really make a difference through our daily witness as we are being watched by non-believers. 5. The character of a Christian was represented effectively--compassion, kindness, perseverance, patience etc. Also a trait that is often overlooked-dependability, which in this case was exactly what the main character needed as so many had let her down. 6. The parallel animal story-lines--I love animals too! I could go on but I don't want to give too much away. There were only a few things that I felt could have been sharpened up. There is a scene where a character is described as "definitely Christian/with a belief in God." The evidence for that seems to have been in his relationship with nature/his appreciation of creation. It is mentioned that he didn't go to church that much and his faith is described in vague terms. I think that because he is described a definitely a Christian more needed to be made here of what a Christian is and how that would impact a life. If you are looking for a book where all the characters are in nice, neat packages, move on to another author. Darlington doesn’t sugar-coat her characters and is honest about pain and struggles without becoming vulgar. Even I, who can be very sensitive, feel like that her books are honest, are a bit gritty- without doing things just for the shock value. It is becoming harder to find books like this, but I think they are some of the most powerful. I loved Roxi and felt so sorry for her throughout the whole book. Yes, there were a couple of times where I was telling her what she should and shouldn’t do (making my sibling worry even more about my sanity), but she was a lovable character. Abby was a bit harder to love, but she was also an understandable character. The more I read, the more I wondered if Darlington was drawing from people she knew, because each character sparkled in their diversity. The plot twists kept me on my toes the whole time. There were a couple of times I was talking aloud saying things like: “No she wouldn’t! That couldn’t happen! Oh, my, it just happened.” Or “Wait! Nooooooo! !” In short, this book really kept my attention. I think my favorite thing about this book was the message. Unlike a lot of even Christian books, Darlington peppered the story with Christians who were living out their faith and willing to reach out to those who were unlovable. Too many people are so cynical in their writing these days and only have maybe one Christian acting loving and the rest are hypocrites. This book was refreshing and inspiring at the same time. The faith themes were there and so well woven in that they fit seamlessly into the story and characters. Nothing feels forced or overdone. Need some suggestions on which books the teens in your life would love? Let us help. I enjoy bringing good books to school and allowing my students to browse through them. Recently, I decided to ask them to do mini-reviews of their favorite reads. So first up, please "meet" Danielle, one of my happy, hard-working freshmen. Danielle has kept a solid B+/A- average in spite of transitioning from homeschooling to attending our Christian high school. As you can imagine, this means lots of studying. Need some suggestions on which books the teens in your life would love? Let us help. I enjoy bringing good books to school and allowing my students to browse through them. Recently, I decided to ask them to do mini-reviews of their favorite reads. So first up, please "meet" Danielle, one of my happy, hard-working freshmen. Danielle has kept a solid B+/A- average in spite of transitioning from homeschooling to attending our Christian high school. As you can imagine, this means lots of studying. In spite of the workload, Danielle makes time to read. Well, that’s an understatement. She’s an avid reader. Without missing an assignment and in the midst of helping take care of her five siblings, Danielle finished Bound by Guilt in two days. Here’s what she had to say about C. J. Darlington’s story . . .
Really enjoyed this book. Found this on one of the freebie download sites - it was worth the read. Great second book to this series! It just gets better. I can't wait to read the others now. I was intrigued by the beautifully bound book and the troubled teen on the front cover. I was thrilled to receive a review copy of such a tension filled, heartfelt book. This novel kept me spellbound on many levels, as C.J. took me through the homey Book Barn - a place I’d love to go and explore its treasures myself. The author’s passion for books and her book experience shines through in this haunting, suspenseful tale of a teen caught in a hopeless web she struggles to get out of. Contrast to I was intrigued by the beautifully bound book and the troubled teen on the front cover. I was thrilled to receive a review copy of such a tension filled, heartfelt book. This novel kept me spellbound on many levels, as C.J. took me through the homey Book Barn - a place I’d love to go and explore its treasures myself. The author’s passion for books and her book experience shines through in this haunting, suspenseful tale of a teen caught in a hopeless web she struggles to get out of. Contrast to a female cop named Abby, a character who feels trapped in a different kind of situation! She too is looking for a way out! Roxie longed for a family of her own and a place to call home. She was abandoned by her mom and shuffled though the foster care system at a young age, ending up with a distant relative. Roxi felt trapped in the family business she wanted no part of. But where would she go? If she didn’t comply, they’d give her back to foster care and she couldn’t have that. Abby Dawson is a cop with an attitude. She joined the force to help people and clean up the streets. Abby felt she did very little good when the bad guys she wanted to put away, ended up back on the streets. Life didn’t quite seem fair in the legal system or in her personal life either. Where was she headed? Did her life have any meaning? Then Roxi and Abby’s life change in an instant! Abby receives a phone call from her dad that rocks her world, and sets Abby on a new path in life. Roxi has started down a new path as well...one she never thought she’d be on – ever. Will this event be the end to both of them? Or will they both seek the truth and be set free, in more ways than one. While reading this story I could sense the authors’ soft spot for teens and the people society throws away. This is a book that will touch your heart, mind and emotions. It will also get you thinking about how you can be the hands and feet of Jesus in your corner of the world. C.J.’s a deep thinker and full of love that radiates on every page she writes. She shows how God uses flawed characters’ to do amazing things in their lives if we let Him! C. J. Darlington has been in the antiquarian book selling business for over a decade. Her passion for books and the experiences she’s had in book selling bleeds through in every chapter. It was enthralling. In the author notes, C.J. mentions she used a real life story as the back drop to this book. It made the story all the more interesting for me. I enjoyed how C.J. took the reader behind the scenes of the mysterious world of antique books, buyers, sellers and thieves. The world that C.J. creates is sincere, interesting, suspenseful and clever! I can’t wait to have my book club read and discuss this book. You’ll definitely want to read this book, I’m sure you’ll be talking about it to friends and co-workers. As I read through this book, clutching the pages in suspense at times, I was enthralled with Bound By Guilt. Even though I haven’t read the first book in the series, I was able to jump right into the story, though enough history is given of Thicker Than Blood that I now want to dive straight into that book. The opening scene, with Roxi and Diego, sucked me right into this story and didn’t let me go until I had read the last word on the epilogue page. What a story this book told! Bound By Guilt is As I read through this book, clutching the pages in suspense at times, I was enthralled with Bound By Guilt. Even though I haven’t read the first book in the series, I was able to jump right into the story, though enough history is given of Thicker Than Blood that I now want to dive straight into that book. The opening scene, with Roxi and Diego, sucked me right into this story and didn’t let me go until I had read the last word on the epilogue page. What a story this book told! Bound By Guilt is filled with a host of believable, three-dimensional characters. Sixteen year old Roxi was my favorite person to read about, but Deigo, Christy, Abby, and Jan were just as endearing. Even though Diego had made a huge mistake in his life, he realized his wrong and wanted to face up to the consequences of his actions. I really came to like this older-brother figure of Roxi’s. Christy and Abby were perfect together—they were more alike than they realized. Survivors of similar evils. I really enjoyed watching their friendship bloom. And Jan. Wow. She was just one amazing lady. The way she cared for Roxi and loved her in a way that no one ever had, was touching. I always looked forward to scenes between these two, knowing they would be powerful. This story was refreshingly unique. With the whole plot revolving around The Great Gatsby book, Roxi’s life as an accomplice to a mother and son business of stealing rare books, and then her struggle to survive on her own, isn’t a normal plot. It was amazing! Just when I thought Roxi’s trouble would be over, something is thrown into her plans and she finds herself worse-off than before. Gifted with a wonderful, engaging writing voice, CJs skill with words is amazing. Reading this book was so easy and I quickly found myself getting lost in the story almost the instant I began reading. She made the scenes come alive. There were times that I looked up from Bound By Guilt and was surprised not to be in the middle of a used bookstore, holding an antique copy of The Great Gatsby, or a R. R. Tolkien book. A very neat, and unique, experience that doesn’t happen often. This is the most inspiring book I've read this year! CJ Darlington is a master at the craft of writing! At the age of 15, she wrote her first book Thicker than Blood. Jerry B. Jenkins noticed her talent too, especially after winning his First Novel contest! Roxi has had a rough life. At the age of eight, the fast lane became too slow for Roxi's mom and she was sent to a foster home after an unfortunate accident left Roxi scarred for life. Bouncing from home to home, no one ever wanted Roxi long. This is the most inspiring book I've read this year! CJ Darlington is a master at the craft of writing! At the age of 15, she wrote her first book Thicker than Blood. Jerry B. Jenkins noticed her talent too, especially after winning his First Novel contest! Roxi has had a rough life. At the age of eight, the fast lane became too slow for Roxi's mom and she was sent to a foster home after an unfortunate accident left Roxi scarred for life. Bouncing from home to home, no one ever wanted Roxi long. After doing some time in Juvie, Roxi's mom's cousin Irene was located and agreed to take Roxi in. Irene, Diego (her son) and Roxi took some pretty exciting adventures around the country in their RV. They went to places Roxi had never dreamed of seeing in person! Irene was also using these kids though to help support their travels. They would seek out old, antiquated, first edition books and lift them from the hands of the bookstore owners. It wasn't until they happened upon The Book Barn that Roxi started to REALLY feel shame and guilt over her "profession". One fateful night changed it all. Abby is still reeling over her divorce and the fact that Michael doesn't let her see Kat as much as she'd like. She's so upset about it all that she twists the mayor's wife's hands a little too much during her arrest and finds herself with a two week suspension from the police force. Now what will she do with her time? Hunter and Christy have their whole lives ahead of them. Everything is going well with the business and their wedding plans are coming together nicely. Love is all they need to survive and they have plenty of it. The only dream being squelched right now is that Hunter's dad will hear nothing of expanding and adding in a coffee shop! Jan and Keith are drowning themselves into their work after their son, Trae, was killed. Can they ever open their hearts again and find a way to move on? Their ranch is their life but at what cost to them? This book weaves together the lives of all these people through a series of twists and suspenseful turns. It is a hard book to put down for any length of time! This book demonstrates unconditional love in times when it's not deserved or even possibly wanted. Forgiveness is also demonstrated in ways beyond imagine and the character of Gordon, even though small, is not insignificant in this story. Will Roxi find peace or forever be....Bound By Guilt? Thanks to CJ Darlington and Tyndale House Publishers for providing this review copy to read. To learn more about our author and to read other opinions, check out the post from Tuesday. The first novel in the series, Thicker than Blood, sets the stage for the continuation of the main characters in Bound by Guilt, May and Christy. The sisters have experienced the loss of both parents in a car accident plus May has feelings of abandonment when Christy took off without explanation after the funeral. Now readers see in Bound by Guilt the intensity notched up by focusing on a teenage girl who has felt rejected all her life. Roxie is now traveling in an RV, living a less than stellar life. Page after page shine of God’s love, forgiveness and provision as readers delve deeper into the tale. I can say that the depiction of foster situations and group homes in the story is pretty close to reality in some though not all homes. There are some good foster parents/homes and some group homes should be held up as models for others to emulate. Please know I used to work in the social work field and group homes. What readers will sense is the fervor of the action that increases as a murder is committed along with the theft of expensive rare books. Roxie’s character insecurity and search for a love that won’t abandon her is really heart gripping. Christy was engaged to the young man who was killed, and the way she works through her emotions to forgive the perpetrators is astounding. Abby is a policewoman and the sister of the victim. She is rough around the edges with many questions. Her past is littered with brokenness. It is hard for Abby to control her anger and emotions, especially when dealing face-to-face with the accused. I liked how the author leaves her open minded by not making a decision for or against God. Real people are like this too. They need time, and it is work that only the Lord can do. Audiences are just going to want to get comfy and read all the books in the series one after the other. The order is Thicker than Blood, Bound by Guilt then Ties that Bind. Follow-up to Darlington's 'Thicker Than BLood', 'Bound by Guilt' contains enough explanatory history allowing for an engaging stand alone read. On the other hand, it was like old home week comfort to catchup with characters from the first novel. are filled with unique and interesting facts inspiring a broader understanding of books and their value. This particular book prominently features F. Scott Fitzgerald's , The Great Gatsby, first edition. A timely focus with the newest movie released this last month. Darlington's writing is filled with quick wit, creative expressions, and a consistently unique voice that adds to the charm of reading her novels. My emotions and attention are fully engaged by Darlington's writing. Every sense is affected. From the aroma of the morning coffees, flavours of the cinnamon raisin bagels, whispered cell phone messages, to descriptive indoor or outdoor settings. The story itself is intense with an increasing pace that had me laying the book aside at times to relieve the tension. Suspenseful drama, mystery, adventure, intrigue, all realistic in culturally relevant contemporary settings. Well developed growth and maturing of likeable characters; strong emotionally influential features of disliked characters. Generational variety in characters who come to life in the reading, exhibiting believable actions and reactions. Enough twists to keep the reader guessing and unsettled enough to keep reading. I recommend Ms Darlington's 'Bound By Guilt' as readily as her debut, 'Thicker Than Blood'. What happens when an abandoned teenager seeks love and approval from the only one who will take her happens to be a criminal? Bound by Guilt is an intriguing mystery involving a runaway and an out-of-control police officer. It begins with murder and the stealing of valuable books. Roxi Gold will do anything to be a part of a family or so she thinks. When things go horribly wrong she knows she has to change how she’s living. Bound by Guilt follows Roxi’s journey filled with guilt, fear and lonelines What happens when an abandoned teenager seeks love and approval from the only one who will take her happens to be a criminal? Bound by Guilt follows Roxi’s journey filled with guilt, fear and loneliness. I found this an easy but tough read. The pages turned freely but the emotions captured by Darlington take time to process. You find yourself looking at teenagers on the street and wondering do they need a home? What can you do to help? And even, should I volunteer to be a foster parent so some child is loved? Those are some of the questions I had and none of them appear on the pages. It was my take-a-way. I met some of these characters in Thicker than Blood, which I enjoyed very much. I felt for Roxi right from the beginning - must be the mom in me. She seemed like such a good kid and was just craving someone to take notice of her and be proud of her. Because of this she was willing to do what she knew was wrong in the hopes that her mom's cousin and her current foster mom would be proud of her. When one of their planned robberies goes bad, Roxi has had enough and decides to head out on her own. I met some of these characters in Thicker than Blood, which I enjoyed very much. I felt for Roxi right from the beginning - must be the mom in me. She seemed like such a good kid and was just craving someone to take notice of her and be proud of her. Because of this she was willing to do what she knew was wrong in the hopes that her mom's cousin and her current foster mom would be proud of her. When one of their planned robberies goes bad, Roxi has had enough and decides to head out on her own. Even though she doesn't know it, God is preparing the road ahead of her and puts people in her path that help her make the right decisions. It is a great story about forgiveness - both for the people DOING the forgiving and those NEEDING it. Like Thicker than Blood, it is definitely not a preachy book but very much sets down beliefs in a "take it or leave it" fashion. A reader does not need to have the same beliefs to enjoy and be touched by this story. I found myself with tears in my eyes a couple of times while reading this one. Keep writing C.J. - can't wait to see what you have in store next! I'm pretty sure that both times I've read this series I've read this book twice. That's probably because it's hard to find which book is the first when reading on kindle. Bound by Guilt was amazing. Let me start out by saying that I really don't like violence in books. Like, not at all. But, if it's done correctly, then that makes a huge difference. And, then violence in this book was real, raw, and hard, but also vague. (In fact, most people would probably laugh at my usage of the word violence I'm pretty sure that both times I've read this series I've read this book twice. That's probably because it's hard to find which book is the first when reading on kindle. Bound by Guilt was amazing. Let me start out by saying that I really don't like violence in books. Like, not at all. But, if it's done correctly, then that makes a huge difference. And, then violence in this book was real, raw, and hard, but also vague. (In fact, most people would probably laugh at my usage of the word violence in connection with this book.) I very much appreciated the way the author handles situations. She makes them so real, but not overly dramatic. All three books in this series garner four stars, which is a pretty hard feat to accomplish with the way I rate books. I'm quite thankful to have this series on my phone kindle so I can read them wherever I am. I simply love this book, despite the sad beginning. My heart felt for Roxi as she tried to run away from the guilt of a crime. She wanted, needed someone to love and care for her. Abby, a police officer, is adamant about searching for the criminal. The ending was exciting and perfect. A wonderful read that reveals God's forgiveness and love for all people. This is an excellent book for teens, young adults and adults. It is not "preachy". Those who are interested in stories about redemption, abandoned children, finding family, crime, law officers, etc. you'll like this one. I was going to try it even though it wasn't really what I usually read, but once I started I didn't feel the compunction to keep going. The content might have been semi-mature, but I don't know since I don't think I got more then 20 pages in. I might try it again later, but I also might not. This might be better enjoyed by someone else, but it's just not my style. What a talent to put a book such as this together. I could not find a place to take a break. I agree with the author. The characters are fictiona! But they could be real. Realistic fiction. Loved this book. Bound by Guilt is an action-packed page turner that will keep you riveted to the end when you will feel satisfied by a story well-told. This is the kind of work readers can expect from C.J. Darlington, who wowed the literary world with her first novel, Thicker Than Blood. And, if possible, the sequel may be even better.Once again, we return to the Book Barn and Christy Williams, who so heroically fought her alcohol addiction, reunited with her sister, and fought off a crazy ex-boyfriend in Thick Bound by Guilt is an action-packed page turner that will keep you riveted to the end when you will feel satisfied by a story well-told. This is the kind of work readers can expect from C.J. Darlington, who wowed the literary world with her first novel, Thicker Than Blood. And, if possible, the sequel may be even better.Once again, we return to the Book Barn and Christy Williams, who so heroically fought her alcohol addiction, reunited with her sister, and fought off a crazy ex-boyfriend in Thicker Than Blood. But this time, Christy is cop Abby Dawson’s “partner” in a murder investigation, after a shocking character death that occurs in the first 50 pages! However, this story doesn’t primarily center around Christy, but her fiancé’s sister, Abby as well as our main protagonist, Roxi Gold, a 16 year-old girl, who finds herself in a heap of trouble after being involved in the aforementioned shocking murder. But Roxi is a sympathetic character, who has been bounced around in the foster care system since she was abandoned by her mother at the tender age of eight. After running away from her mom’s deranged antiquarian book thieving cousin, Irene, and her son, Diego, Roxi finds herself with nowhere to go and no one to turn to. Similarly, Abby, who is tracking down the trio, is just as lost. Darlington marvelously reminds readers that redemption from the guilt to which we are bound, our sin, is found in Christ alone. Against the backdrop of the beautiful Colorado Mountains, Darlington weaves her tale. Her descriptions of setting and character are detailed and she always keeps the plot moving at a steady clip. One fault I find with this novel is that Abby Dawson seems a little flat and one-dimensional. I didn’t find myself emotionally invested in Abby, nor did I find her terribly interesting. She was just helpful in moving the story forward. My other hang-up is that while the Christian characters in this book say they are flawed, I don’t actually see any evidence of these flaws. For example, Christy Williams enters a bar after learning of the tragic murder and almost drinks, but she doesn’t. In fact, she doesn’t seem to have any of the problems she did in the first book. I think adding a bit of an edge to these characters would make them more believable. Still, I immensely enjoyed Bound by Guilt and cannot wait to read more of C.J. Darlington’s delectable writing. There were so many connections to make with this book. My first connection was with Abby Dawson. She was a cop who felt she had failed at her marriage and then felt like she was a failure as a cop. Her ex-husband, a lawyer and fought for custody of their daughter and won. I admired Abby for not putting her daughter in the middle of their divorce and problems. I know there were times she wanted to shout and explain the truth to her daughter. I know when I went through my divorce it took every oun There were so many connections to make with this book. My first connection was with Abby Dawson. She was a cop who felt she had failed at her marriage and then felt like she was a failure as a cop. Her ex-husband, a lawyer and fought for custody of their daughter and won. I admired Abby for not putting her daughter in the middle of their divorce and problems. I know there were times she wanted to shout and explain the truth to her daughter. I know when I went through my divorce it took every ounce of strength I had not to let my children know how I felt when they would tell me what new thing their father had purchased for them. Our problems were not theirs and so I kept my mouth shut. Abby did the same thing. I understood her strained relationship with her father. When her brother is killed some of her old problems and feelings resurface. Roxie Gold reminded me of so many students who have passed through my classroom. One kid in particular stands out. He would misbehave daily. At the end of the year he came to thank me for being his teacher. He told me I was his favorite. I told him that I was surprised because I had griped at him almost daily. With a grin on his face he said, "Yes I know. At least I know you loved me." How sad that kids will do anything, even if it is wrong for an ounce of love. Roxie was like that. Since she'd been passed from foster home to foster home. She felt lucky to be with her aunt Irene and her son Diego. She didn't like that to win her aunts approval she had to help steal rare books. It was obvious from the outsider's point of view, meaning the reader, that Irene was a user. She exploited Roxie and her own son for personal gain. That is not love. Greedy they change their plans and go back to the Book Barne to steal some valuable first editions. The manager, whose apartment is connected to the book store, hears the break in and confronts them. That is when a gun is produced and he ends up dead. Roxie can't live with this so she runs away from Irene. She is picked up by Jan and taken home to stay with Jan and her husband Keith. It is here she finds out what unconditional love is. This book is full of hope, love and forgiveness. The Christian theme throughout is wonderfully done. It is not an "in your face" preaching. God's truths are presented in real life lessons that we se examples of around us all the time. This was a wonderful book. I had not read her first book Thicker Than Blood but I will. I also look forward to her next book. This is an author we need to watch closely. Her writing is fresh and touching. Her characters are so real you can't help but identify with them. Roxi Gold's life has been anything but golden. At sixteen, she's been through several foster homes and finally ended up with her mother's cousin Irene and her son Diego. Wanting to be accepted and loved within this thi Author C.J. Darlington is a home school graduate and a lover of antique books, two things she and I have in common. I've heard about her novels since her first book debuted in 2009, and I always thought I would enjoy them. I was happy to be proved right in reading "Bound By Guilt." An antiquarian bibliophile I’m not. But for those who are, it’s a high-stakes book collection! Books can range from $40 up to $40,000 for just one book! This is the world Roxi Gold finds herself landing into, ’rescued’ from the life of a foster-home shuffled, abandoned girl, when her Aunt Irene Tonelli and her son, Diego, finally take her in. Traveling the country, they stake out bookstores and steal the rare, preferably first edition books, to sell to make a living for themselves. How did Roxi e An antiquarian bibliophile I’m not. But for those who are, it’s a high-stakes book collection! Books can range from $40 up to $40,000 for just one book! This is the world Roxi Gold finds herself landing into, ’rescued’ from the life of a foster-home shuffled, abandoned girl, when her Aunt Irene Tonelli and her son, Diego, finally take her in. Traveling the country, they stake out bookstores and steal the rare, preferably first edition books, to sell to make a living for themselves. How did Roxi ever get this low? Will she ever get out? Officer Abby Dawson’s life has become a job, not the career of ‘saving the world’ that she once dreamed of. It’s after one of the bookstore heists that her life changes forever. She’s looking for justice by the law, while Roxi is running from the law. C.J. 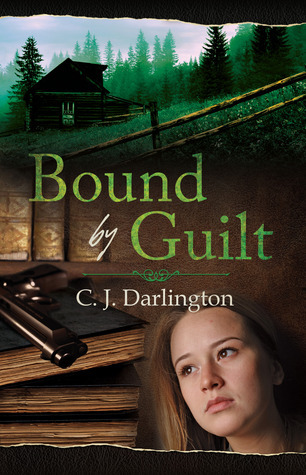 Darlington, in Bound by Guilt, wrapped multiple meanings into her title. She delineates the different levels of depravity of life–extreme selfishness, greed, danger, illegality, and murder. The intensity of danger leaps from the pages of the book. But she displays the love and acceptance that definitely touches the depth of your heart as the story unfolds. C.J. does an excellent job of mixing the different personalities of the characters and the power some have over the others. Their lives are very real-to-life, ranging from pain-filled and lonely, to fearful and anxious, to sharp and legalistic, to uncaring and greedy, and finally to love and acceptance. A lot like some of our lives today during different seasons of our lives. Although justice is one of the main thrusts of the book, C.J. brings in the realms of truthfulness, forgiveness, and unconditional love, which she uses to bring about the first in a way that draws you through the book, page after page after page! Great job, C. J.! I enjoyed meeting Christy’s sister once again from C.J.’s first book, Thicker Than Blood, and how she ministered to those in grief in Bound by Guilt. You’ll have to read the first book to find out more about her! All Roxi Gold wanted was love, a mother's love. But it seemed to be the most elusive thing in her life. Taken away from her own mother at eight years old, she has been in and out of foster homes for the last eight years and at sixteen she is now placed with her mom's cousin Irene. However even with a family member, however distant, Roxi doesn't find the family feeling she is looking for. Instead she finds herself living with a criminal. A criminal who is willing to use whatever she needs to use, to get the books she wants stolen, so Roxi is drug into the little criminal ring of book theives. Roxi, does not enjoy this life, but she wants to be a team player, she wants it to all work out so she don't have to go to a new foster home, but the tenseness she is feeling is not helping things at all. Little does she know that things are fixing to blow up in all of their faces and a life will be lost. C.J. Darlington, dives into the shady side of book dealing. Truly this book was a book I could not put down, I was totally into Roxi's story, wanting things to turn out for her, I cried as she found herself rejected once again by the mother, she just wanted love from. I cried as she slept by the dumpster. I could totally relate to Roxi, she came to life for me. Diego was also a very real character to me, just a kid who trusted his mother, more than she deserved, and she led him into a life of crime. C.J. 's writing seemed to deepen with the story development, truly making you feel you were part of the story. Most definitely a book to read and share with friends! 393 pages Discussion/Reader Group Questions included $12.99 US 4 stars. This book was provided for review purposes only, no payment was received for this book. BOUND BY GUILT by C.J. Darlington is an amazing contemporary christian fiction set in modern day America.It is this author's second book.Her first book "Thicker Than Blood".While this a sequel,this second book has no connection to the first book,and is a stand alone. This story has multiple intertwining stories with Roxie and Abbey the primary characters. Roxie,is a runaway,she thinks a throwaway,abandoned by her mother as a child,moved from foster home to foster home,and finds a friend in Diego BOUND BY GUILT by C.J. Darlington is an amazing contemporary christian fiction set in modern day America.It is this author's second book.Her first book "Thicker Than Blood".While this a sequel,this second book has no connection to the first book,and is a stand alone. This story has multiple intertwining stories with Roxie and Abbey the primary characters. Roxie,is a runaway,she thinks a throwaway,abandoned by her mother as a child,moved from foster home to foster home,and finds a friend in Diego and his mother.Who are actually book thieves of rare books.She joined them and when disaster occurs,she is on the run again,and she has lost faith in God and her fellow man until she meets a family who takes her in not only for shelter but also for love.Abbey,a police officer,a mother,whose ex-husband has been given custody of their daughter,her brother is murdered,and she has also lost faith in humanity and God.This is a story that will capture your heart and keep you on the edge of your seat while you watch each character in this multiple facet story come to life and some find their way. You will see how forgiveness can not only give you freedom but also remove the bound of guilt. Bound by Guilt is an amazing, positive story of not only God's love but of love,forgiveness,guilt,healing and inspiration with powerful characters and a powerful plot. Darlington is really an author to keep a watch out for,as I have read both of her amazing,powerful stories of love,faith and inspiration.This is a MUST READ and a keeper.I enjoy how she weaves faith and God's love into her stories without preaching and has intrigue,suspense,mystery in a powerful story.This book was received for the purpose of review from On Trakk and the publisher and details can be found at Tyndale Fiction and My Book Addiction and More. This story kept me captivated till the very end. There are many layers to the story and it’s very well paced. Granted some of the characters weren’t as fully vibrant as they could have been, but she twisted a good tale around them. Abby, the police woman, is strong, harsh and bold. I liked her but Jan was my favorite character and the most three dimensional in the book. I anticipated learning that Jan was controlling with selfish motives, but it never came about. She is loving and forgiving, a r This story kept me captivated till the very end. There are many layers to the story and it’s very well paced. Granted some of the characters weren’t as fully vibrant as they could have been, but she twisted a good tale around them. Abby, the police woman, is strong, harsh and bold. I liked her but Jan was my favorite character and the most three dimensional in the book. I anticipated learning that Jan was controlling with selfish motives, but it never came about. She is loving and forgiving, a reflection of the nature of Jesus, even after all the damage in her life. Okay, now about that “Christian” aspect of this book… The preaching was noticeably toned down from the first book. Which is a plus! There was less jibber-jabber about religiosity and more heartfelt actions that reflect the values of the bible. Which is what I’d rather read than preachy fiction. And the author didn’t make us to go to church in this book to see God in the story. (Thank you!) The ending was touching and satisfying even though there was some over-explaining in the end. Some things can be left unsaid and our imaginations can make the connection to faith principles. Regardless of the negative points... This story touched me. I loved Roxi’s ending, I was nearly in tears. When emotion is evoked from a story, you know the author succeeded. I’d rate it at a 3: A good read, no regrets. It’s worth the time to read especially compared to the first book. The cover is pretty and I like the combination of antique books and the ranch (again). C.J. Darlington’s sophomore release marks her first venture into publishing after winning the 2008 Christian Writers Guild’s Operation First Novel contest. Her first book, Thicker than Blood, was an excellent glimpse into the world of antique book collecting and selling. Now she has continued this story in a fascinating new way, focusing on external characters while, at the same time, returning to the familiar favorites that we loved from the first book. Though her career started out as a contest C.J. Darlington’s sophomore release marks her first venture into publishing after winning the 2008 Christian Writers Guild’s Operation First Novel contest. Her first book, Thicker than Blood, was an excellent glimpse into the world of antique book collecting and selling. Now she has continued this story in a fascinating new way, focusing on external characters while, at the same time, returning to the familiar favorites that we loved from the first book. Though her career started out as a contest winner, with this release, Darlington has firmly established her reputation as a respected author with a great future. The characters, the plot and the description once again show us that Darlington’s talent extends far beyond expertise in book selling and reviewing. C.J.’s characters are heartwarming and genuine with real questions, real mistakes and no ‘Christian-ese’ answers. Roxi’s journey is so real that at times, it begs the question as to how C.J. could have possibly captured this story with such vivid clarity without living on the street herself. I loved watching how this young girl experienced very real and painful guilt over actions that couldn’t be reversed and consequences that needed to be owned. I cried as she struggled with self value and always feeling unwanted and unloved. And I rejoiced in the journey when I got to the end. This book was nothing short of fabulous. If this book is any indicator, C.J. Darlington is someone we’ll all want to watch in the future. I can’t wait to see what she has in store for us next and what God’s going to be doing with this fantastic new writer. Nitty gritty honest truth under your skin, but you have to turn to the page and find out what happens next. Roxi's life is rough and at the beginning I just wanted to scream knowing Christy's past from the first book that she could tell her and it would all be okay. But then things happen and it will never really be okay again. Abby seems to have had one thing after another and it's baffling how strong these women are and that they can keep going. It felt to me that the ray of light from the first book was gone (as in a male character named Hunter), but just like how God works in everyday lives there are other instances and people put in position to show you his love. Inspiration for getting up the next day and moving forward with your life. I'm pleased to have discovered the stories from C.J. and look forward to more in the future. This is one emotional read!! Please don't read Bound By Guilt until you've read Thicker Than Blood. You will be greatly depriving yourself of emotions that I think should be felt when reading Bound By Guilt. CJ's writing has shocked me more than any fiction I think I've ever read. In both books, I've been so shocked at something, I had to walk away from the story just to digest what happened or what was revealed. I found myself wanting to cry just thinking about it later! While this book has sev This is one emotional read!! Please don't read Bound By Guilt until you've read Thicker Than Blood. You will be greatly depriving yourself of emotions that I think should be felt when reading Bound By Guilt. CJ's writing has shocked me more than any fiction I think I've ever read. In both books, I've been so shocked at something, I had to walk away from the story just to digest what happened or what was revealed. I found myself wanting to cry just thinking about it later! While this book has several of the same characters from Thicker Than Blood, there are a several new characters brought into the mix. The story mostly centers around Roxi. My heart just completely went out to Roxi. It's so heartbreaking that her story is true for so many teens out there! It really makes you think about all the foster kids out there. My favorite new character was Jan, though! Jan and her husband, Keith own a ranch close to May(a character from Thicker Than Blood). They've lost their only son, and this excerpt is one of my favorite lines ever! ""It was the quickest of flashes, but it made me realize my grief wasn't doing me or Keith-or anyone-one lick of good. Trae was in heaven. Even if he could come back, he wouldn't. In fact, if anything, I should've been envious he'd gotten there before me. I realized Trae isn't in my past. He's in my future."" Bound by Guilt is the perfect title for this book. It's hard to post a review without giving away spoilers, but I'll try. There were some things at the end of the first book in this series that had me wanting more. Well, in this story I got to see what I wanted, then wham! My heart ached and the tension just kept building from there. I could picture the traumatic event because it was so well done. Every time the situation was remembered I had a flashback myself. The description of the horrible e Bound by Guilt is the perfect title for this book. It's hard to post a review without giving away spoilers, but I'll try. There were some things at the end of the first book in this series that had me wanting more. Well, in this story I got to see what I wanted, then wham! My heart ached and the tension just kept building from there. I could picture the traumatic event because it was so well done. Every time the situation was remembered I had a flashback myself. The description of the horrible event was superb. The author did a great job showing a variety of situations that tugged on this reader's heart strings. I love how the author showed rifts in families and relationships in both books and showed how important it is to always keep a clean slate. What a great lesson. The thing that intrigued me about this book the most was the foster care situation. I've worked with foster children for years as a child protective services worker and this author did a great job showing the inner turmoil that foster children go through. I loved how the author paired Roxi with a dog who needed someone and who had no one just like she did. Wonderful analogy and critical to her healing. The rest of the book continued in a similar manner until God hooked Roxi up with someone who truly cared. I was inspired by the themes in this book and loved the ending. I also love how the author isn't afraid to hurt her characters--a lot-- but that always makes for a better story. Great sequel! Have you ever made a choice in your life just to please someone and then find out that it didn’t matter what you did anyway you would never please that person? That is what happens to Roxi, a 16-year-old girl who struggles to find the love she never felt from anyone. In trying to do so, she makes choices that she regrets that unfortunately have adverse effects to everything she was trying to achieve in the first place. Roxi is a very likeable character that I can relate to, as I believe many oth Have you ever made a choice in your life just to please someone and then find out that it didn’t matter what you did anyway you would never please that person? That is what happens to Roxi, a 16-year-old girl who struggles to find the love she never felt from anyone. In trying to do so, she makes choices that she regrets that unfortunately have adverse effects to everything she was trying to achieve in the first place. Roxi is a very likeable character that I can relate to, as I believe many others will also. I understand her lack of trust in people due to her past and her desire to just be loved. She’s trying to make right choices, but the more desperate she gets her choices do not seem to be going very far until a stranger named Jan sees her struggle and following her own instincts decides to follow what she feels God is calling her to do.